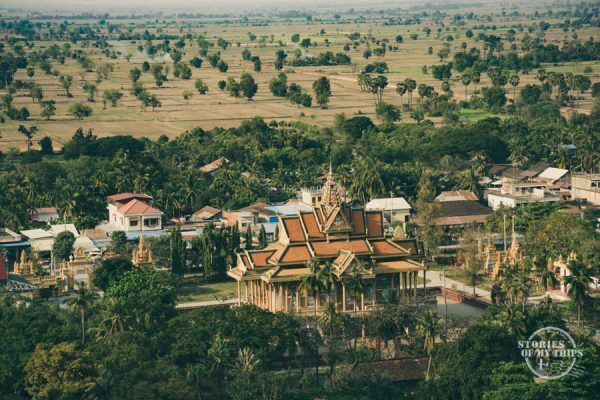 In this post we’ll tell you all about routes and transportation between cities and within cities, so you can plan your next trip to Cambodia with ease. We arrive at Siem Reap in the minivan that picked us up at the border with Laos. Our hostel was in the very center of the city so we could walk everywhere. That same day we rent a motorcycle to visit the temples of Angkor Wat on our own and at our own pace, starting very early the next day. 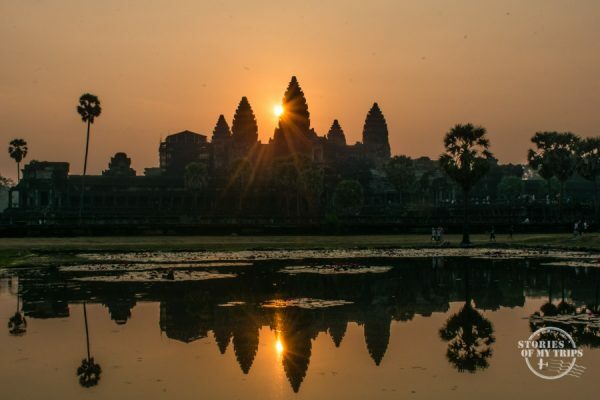 Para ir a Angkor Wat hay varias opciones. La más popular es contratar un tuk tuk que te recoge en el hostel, te lleva a ver los templos y vuelve y te deja en el hostel. Con esta opción hay que tener muchas ganas de negociar porque hay varios que te quieren cobrar más de lo que es, y mucho cuidado de que no te quieran estafar. Lo más recomendable es ir con alguien recomendado por el hotel. También está la opción de ir en bicicleta, pero hay que tener en cuenta que son casi 8km (20 minutos en moto) y que la distancia entre los templos puede ser entre 15-30 minutos, además del calor (o la lluvia) que puede hacer dependiendo de la temporada en que visites. Algunos turistas visitan los templos usando buses turísticos y otros contratan conductores de auto o de moto. Nosotros alquilamos una moto que nos vino muy bien para llegar al amanecer y para visitar los templos a nuestro ritmo, incluso nos dio la flexibilidad de volver al hostel a descansar (y escapar del calor de medio día) y volver por la tarde. To go to Angkor Wat there are several options. The most popular is to hire a tuk tuk that picks you up at your hostel, takes you to the temples and drops you off back at your hostel. With this option, you need to be willing to negotiate because there are many drivers who will want to overcharge you, and also be very careful of scams. It is best to go with someone recommended by your hotel. There is also the option to go by bicycle, but keep in mind that it’s almost 8km (20 minutes by motorcycle) away and that the distance between the temples can be between 15-30 minutes. In addition, think about the heat (or rain) depending on the season you visit. Some tourists visit the temples using tour buses and others hire a car or motorcycle with a driver. We rented a motorcycle that was great to arrive on time for sunrise and to visit the temples at our own pace, it even gave us the flexibility to return to the hostel to rest (and escape the heat at noon) and return in the afternoon. We were in Siem Reap for 4 days, 3 of them visiting the temples. Our next destination was Battambang. To go from Siem Reap to Battambang we bought tickets at a travel agency in front of our hostel where they picked us up in a tuk-tuk and took us to the bus station. This bus left us at the Battambang bus station where a tuk-tuk offered to take us to the hostel for free. Obviously, on the way, he offered all his services and we ended up negotiating a tour around the most important points in the city and the outskirts. He took us to the bamboo train, to several temples and to the Killing Caves where we also saw millions of bats flying out a cave at sunset. Pretty amazing! 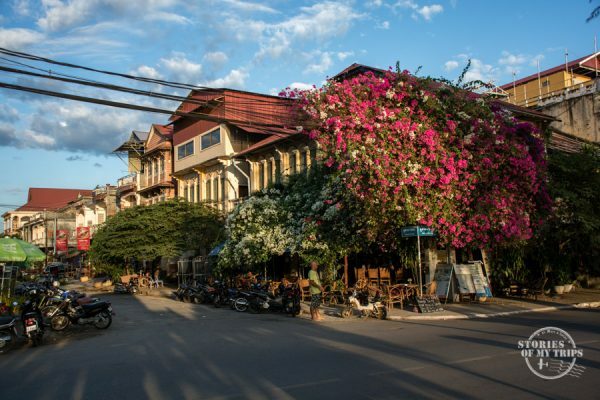 We stayed in Battambang for two days and from there we took a very early bus to Sihanoukville. To go from Battambang to Sihanoukville the staff at our hostel helped us to buy a ticket from Sorya company. There are no direct buses, every bus stops in Phnom Penh and then you have to change to a bus to Sihanoukville. 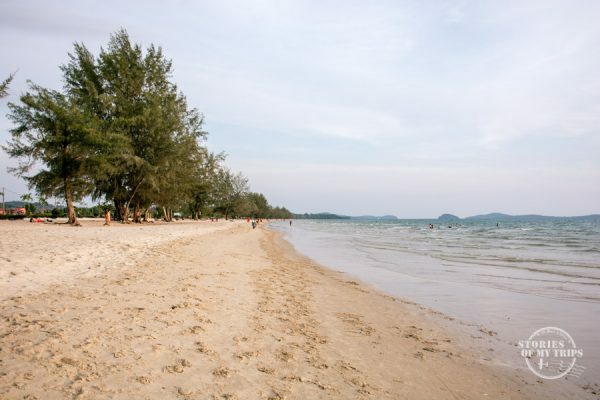 This trip lasted all day, we left at 6:30 am and arrived at night in Sihanoukville. Since we knew we were going to arrive late, we booked a hostel near the bus station and spent the night there, but our goal was to stay in Otres Beach, so the next day we took a Tuk Tuk to our hostel, and from there we were very close to the beach so we only walked around the area. After a few days in Otres, we took a ferry to Koh Rong. To go from Sihanoukville to Koh Rong we bought the Ferry ticket at an agency in Otres Beach (where we were staying) that included the transportation to the port. A van picked us up in our hostel and took us to the port where we took a ferry that dropped us off at the Koh Touch main beach, but we wanted to go to the quieter part, Sok Sak. For this we had to negotiate with some fishermen to take us on their boat to the other part of the island because there are no roads, you can only arrive by sea. There are many people offering their boat in the harbor, so it is not a problem to find someone to take you there. We rented a bungalow in front of the sea and we did not move from there for 3 days, just one afternoon we booked a snorkeling tour for another part of the island. We loved this island, it’s one of the best beaches we have seen in the world and we would have loved to stay more than 3 days, but we had to continue the route, we had a lot more to do. To go from Koh Rong to Kampot we had to buy a bundle ticket. Fortunately, in Sok Sak, there is an office that sells bus tickets and we could buy one to go to Kampot. 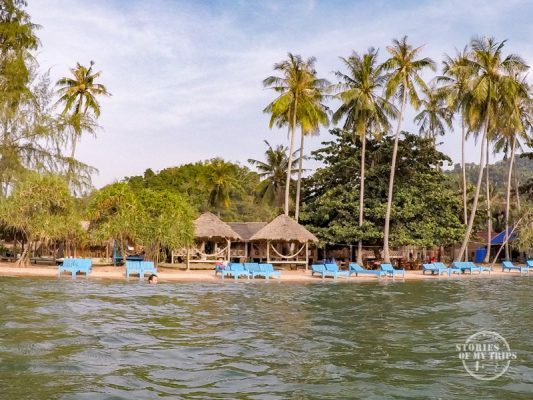 First, we had to take a boat to the main beach, then take the ferry back to Sihanoukville and then find the travel agency from where the bus to Kampot was going to depart. Fortunately, it was close to the port and we were able to leave our bags there while we were looking for food. In the end, it was not a bus but a rather uncomfortable minivan that took us to Kampot. When we arrived we walked to the hostel and from there we rented a motorbike to go around. We went to Fishing island, and to the salt flats and then to Bokor National Park, all by motorbike. To go from Kampot to Rabbit Island we first had to go through Kep. In the hostel they helped us with the reservation of the tickets and a bus came looking for us. The ride was short but the bus dropped us off outside the city so we had to pay a Tuk Tuk to take us to the port. We arrived at the port at 11 am and the next boat to the island left at 1 pm. They leave at 9 am and 1 pm. We bought the ticket at the office in the port. Rabbit Island is an amazing place that has everything to make us happy. We rented a bungalow in front of the beach that had a great restaurant and Happy Hour all day so for almost a week we did not move from there. 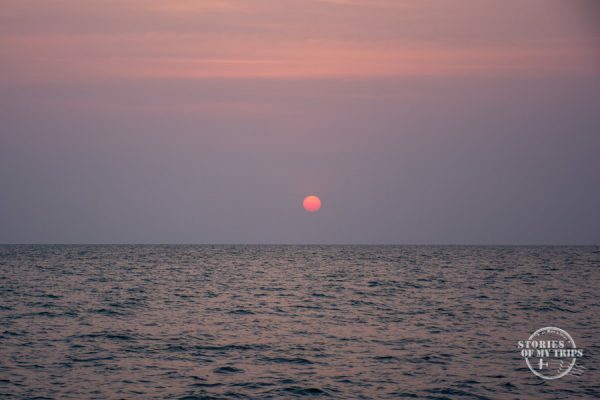 To return to Kep there is a boat at 4. We wanted to spend a couple of days in Kep, so we rented a motorbike to visit the pepper fields, the colonial houses, and the national park. It is a very quiet city with a nice beach and if you book a hostel in the center you can easily walk around. To go from Kep to Phnom Penh we bought the ticket at the hostel. A bus would pick us up in front of the hotel on its way to the capital, so we wouldn’t have to go to the bus station, but we had to wait for it on the sidewalk for a long time. 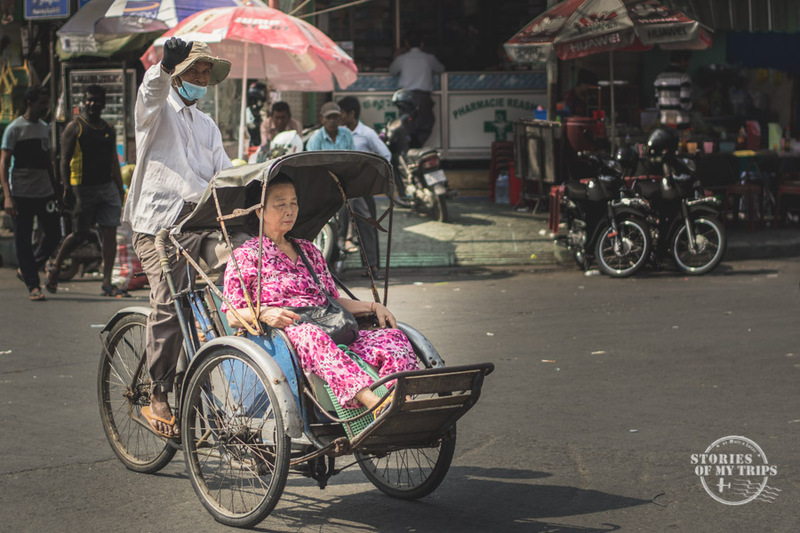 When we arrived in Phnom Penh we had to find a Tuk Tuk to take us to our hostel. 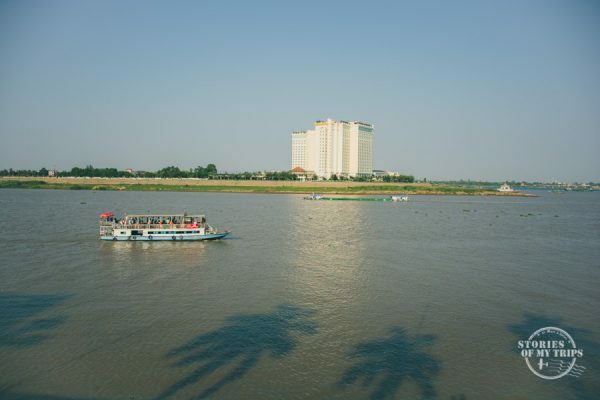 Being in the downtown area you can walk to temples, parks and along the river. In the city, there are lots of options to go anywhere, motorcycles, tuk-tuks, cyclos and also public buses! All the time there are going to be people offering you transportation. We negotiated with the same Tuk Tuk who took us to the hostel a trip to the Genocide Museum and the Killing Fields. 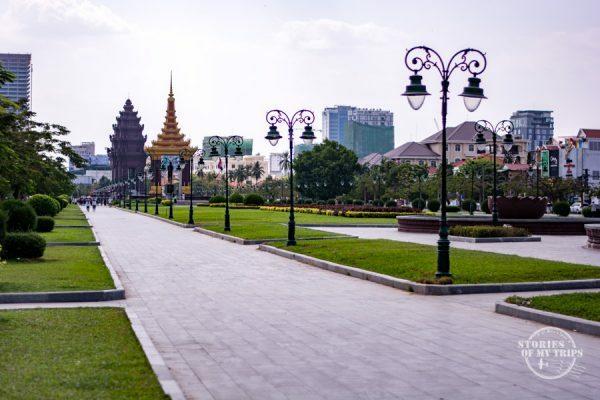 You can get the Vietnam visa personally in the embassy in Phnom Penh. To get there from the center you can take bus number 1 that costs KHR1500 (or, 38 USD) and drops you off right in front of it. This was a funny story. 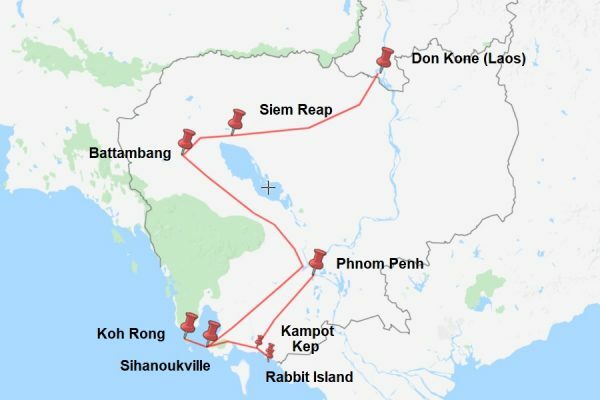 To cross the border to Vietnam and go to Chau Doc, we bought a bus + slow boat ticket from the offices in the port, because it was cheaper than the fast boat. Supposedly the bus was leaving at 8 am, then we were to be picked up at 7.30. But at 8:15 they hadn’t arrived. We had to call the driver and the van arrived a while later. He took us to the port and we had to wait there for a long time. The rest of the people who came with us in the van were going to take the fast boat, and they got on the boat right away, but we were left aside waiting for a long time. Then the guy comes and tells us that there is a lot of traffic, that the bus is going to take a long time to reach the border and that we were going to miss the slow boat, so we should buy a ticket for the fast boat for more money each (scam?). I told him that it was not our fault that we were late because they picked us up late and they also had us waiting for a long time and that we were not going to pay him anything else. Finally, the same van that picked us up came back and took us to the border, only to the two of us. I felt bad that the driver had to go there just for us, but hey, it’s not our fault, they could have just gotten us on the fast boat. 3 or 4 hours later we reached the border and the driver took us to stamp the exit and then another person from the company came for us, paid the driver and took us to stamp the entrance to Vietnam. After crossing the border we saw that the same people of the van who left in the fast boat were there waiting. In the end they got us in that same boat with everybody, in which they could have gotten us from the beginning, which by the way had a lot of empty spaces (???) After stopping for a while at a fish farm, I do not know what for, they made us look at some fish and then we went back to the boat and we finally arrived at Chau Doc. The hostel was relatively close to the port, so we went walking. This ended our journey through Cambodia, a charming country full of beautiful places. In future posts, we will tell you more details about each place we visited. We are Mafe and Lucas, a couple of travelers from Latin America who share their stories, itineraries, experiences and photographies with everybody that want to learn a little bit more about the world.